These are my favorite, favorite solid tees (I have written about them on several occasions before). They are just hefty enough to feel substantial, they layer like a dream and they are long and lean. Lemongrass ($7.34), green flash ($5.95) and peacock ($8.16). A few of the other colors, like indigo, are also under $10. Keep in mind that these normally cost $26 a piece. 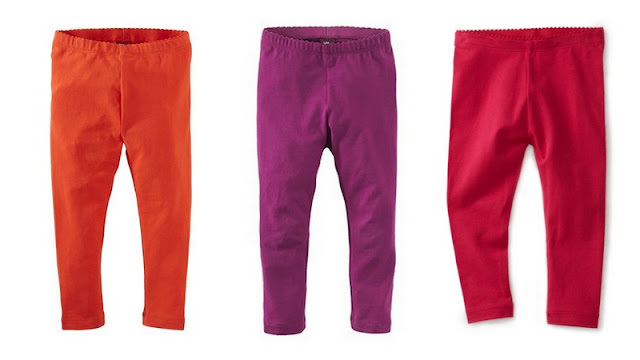 Nothing is more practical than leggings for little babies, and these colors would look great with the solid tees above (for both boys and girls). Persimmon ($7.30), bouquet ($8.55) and lily ($8.59). Full price for these is $22. 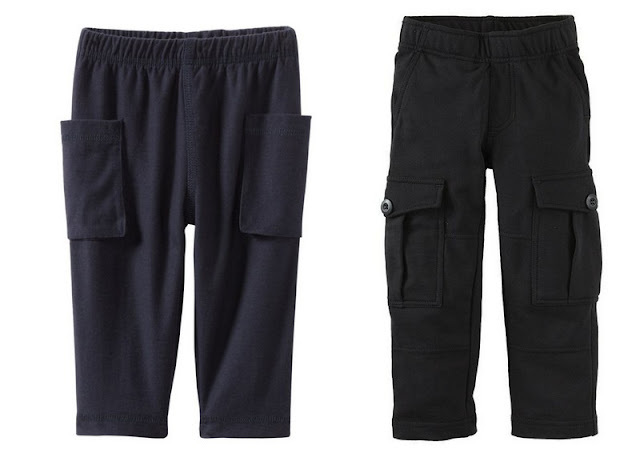 If you want a slightly more masculine look for your baby boy, these cargo pants are both good options, and good prices. Indigo side pocket pants ($7.68, originally $22) and black knit cargo pants ($8.14, originally $32). If you need a straightforward baby gift, you cannot pass up these little Chinese sweater sets for newborns. 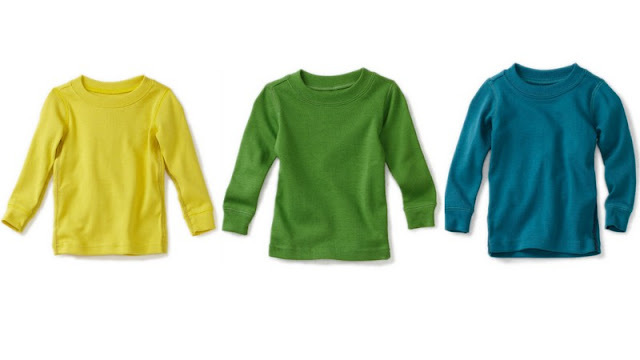 The sweaters are normally $45, but the pink is now just $14.67 and the indigo is just $8.64 (81% off)!!!! Add the pants to the Chinese sweater in a great little set , and the price is not much worse ($17. 23 for pink and $19.19 for indigo). Keep in mind that the set normally costs $62. 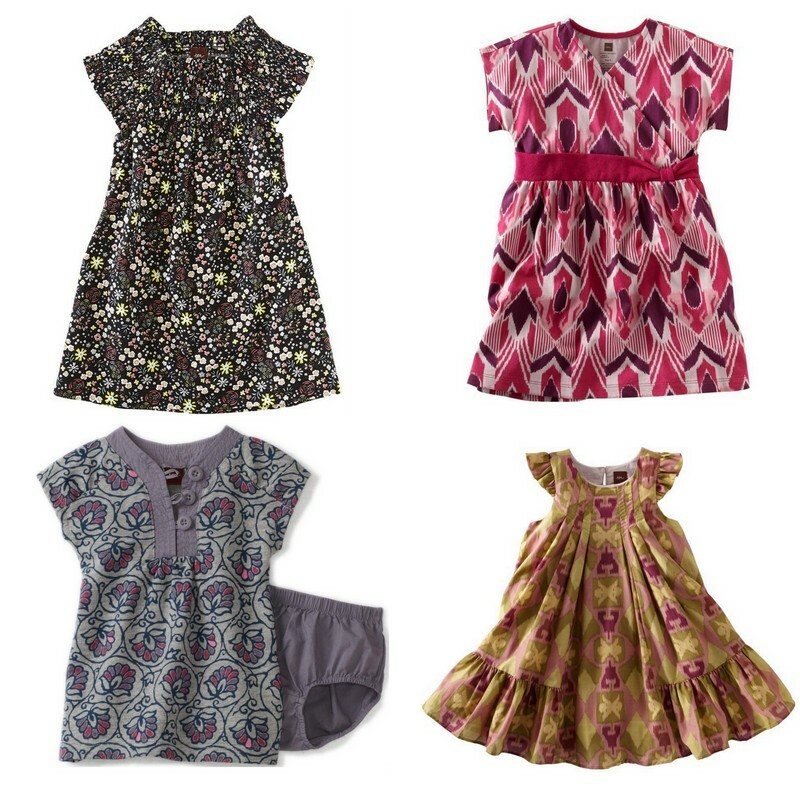 And finally, some little baby dresses. The black floral Lunefuld playdress has been marked down from $39 to $14.36. The pinkish Ikat knot dress has been reduced from $35 to $10.98. The gray and dusty purple Neka dress was $45 and is now $17.44 and the silk/cotton blend Endek Ikat flutter dress has been reduced from $89 to $25.14. Keep in mind that I am only showing you four of twenty-one dresses that are at least 50% off. Find the rest here . Thanks for the note, Elizabeth! I am so glad to hear that people are finding good deals. Happy New Year to you and your little people! I found your blog recently and you are getting me in trouble :) So wish they had some larger sizes on sale too. I found Tea runs a little smaller and my 14 month old really doesn't need anything till next fall. I will keep looking though! I got the sweater set; it is BEAUTIFUL and so well made. I also got other sale items from tea collection. they fit my skinny boys very well. thanks to you, I've found a quality clothing that fit them well! Your descriptions are right on. Your picks have been working out well as gifts too. Thank you again! Happy new years to you too! Any possibility of making your website accessible in google reader? I'm so glad that the sweater set and other items have worked out! I have been lazy about getting Google Reader up and running (I installed the button, but I don't think that it is working correctly). Thanks for putting this back on my to-do list. Have a lovely weekend!